Hey Kevin, it’s your time to put up or shut up! The Warriors are currently seeing a growing lead in the first quarter against the Spurs, game 4. Klay Thompson is the only player who is experiencing some inconsistency but maybe the incoming rest will help him adjust to the physical nature and intensity that the Cavaliers will bring once they stop messing around with the Celtics. Adam Silver must’ve told them to chill and let the Celts get a game. Steph Curry has been taking the ball to the hole and he’s been having good looks from midrange than usual. He’s moving his feet well on the defensive end as well, although, he still endured some shaky foul calls in Game 3. Reminded me of the 2016 NBA Finals. I won’t forget Iman Shumpert running into him and the refs calling a foul on Steph who was already stationary in his position on the floor. Bets must have been placed, eh? Steve Kerr is out and everyone is concerned about the progression of his health. He’s been traveling with the team and I’m sure that behind the scenes he’s doing what he must to keep this team rolling so they can win another championship. I didn’t mention that Draymond Green is looking like the greatest glue guy every assembled and placed on an NBA roster. Potential Defensive Player of the Year. He has my vote with Kawhi as a close second if I incorporate the playoffs into my vote. If I didn’t, then he’d be a distant second. I currently think highly of Kawhi right now. He’s not here to put a stop to any of this madness. LeBron is up next, so this leads me to what I really want to touch on. The finals will be about two men: LeBron James and Kevin Durant. Can Durant elevate his game to another level? Will he be able to attain the eye of the tiger? I’m sure LeBron will matchup with Kevin, and this is where he will be depended upon to still perform and put up his usual stats and more. I have very high expectations of him if the Warriors want to have any chance to beat the Cavs. That’s the reason he came on board, right? To be able to get back at LeBron. What better way to win your first championship than to do it over LeBron? His own fans call him the Greatest of All Time. There’s no better way to win a ring than to add a win over LeBron onto your resume. Regardless of who you’re teamed with. They said LeBron would be better than Jordan if he beat this jump shooting Warriors team. Let’s not mention the league caters to an up-tempo game with much less physical play and he’s 6’9 250-260. Football! Elevate your game Kevin! LeBron is bringing his well-oiled Cleveland Cavs machine to the war and he’s looking to repeat. Can you stop him on his way to creating a dynasty? Can you etch your name above those who should’ve won a championship but they seen the great Michael Jordan? Can you get that elusive ring that Barkley, Miller, Malone & Stockton, Payton & Kemp, Patrick Ewing, Allen Iverson, and many others don’t have? Should we add Carmelo Anthony to that bunch right now? Can you be the difference maker in this series? Can you take over the game when you need to and not be a spectator to the Steph Curry show? Will you be what this team was missing last year when they gave up a 3-1 lead? Ironically, the same lead you forfeited to the same team you now are a part of. Are you here just to get Golden State to the promised land and shockingly sabotage their plans and laugh in their faces when you go back to Russell Westbrook and OKC with all their plays, knowledge, and execution plans as you disappear in the Finals on purpose? That’s a conspiracy but I wouldn’t put it past you until you prove me wrong. 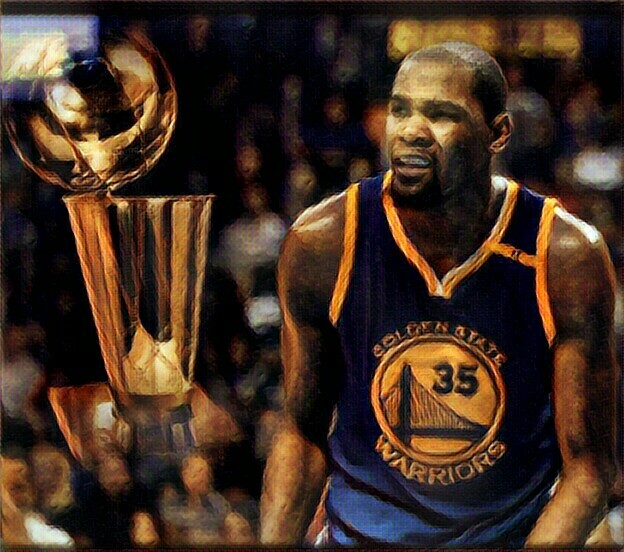 This year it’s all about you, Kevin Durant. It’s time to put up or shut up. Period. Barring injuries or deficiency in team health, you have no excuses. Deliver!